The Bolt LT takes Teradekâ€™s industry-leading wireless performance and packages it into an affordable, streamlined series of zero-delay wireless video systems. The LT line is available in 500ft or 1000ft max-range models, with the LT 500 offering external antennas on the transmitter for enhanced wireless performance - this package includes a 500ft Wireless Receiver. 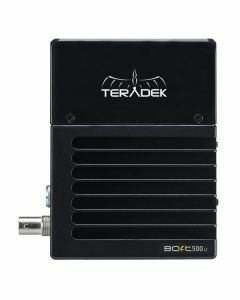 Existing 3rd-generation Bolt users can rejoice because Teradek designed the Bolt LT to be backward compatible with the Bolt 500, 1000, Sidekick II, and 703 Bolt, as well as the powerful new Bolt XT.This feature makes it easier than ever to build onto existing Bolt systems or plug into others already operating on set.